This formula is designed to help stimulate your imagination, help you gain clarity about your life, and inspire you to take initiative in following your passions with purpose and enthusiasm. People sometimes report that insight comes in their dreams and odd moments so keep a journal handy! Mama Love products combine the emotionally beneficial properties of flower essences and aromatherapy. 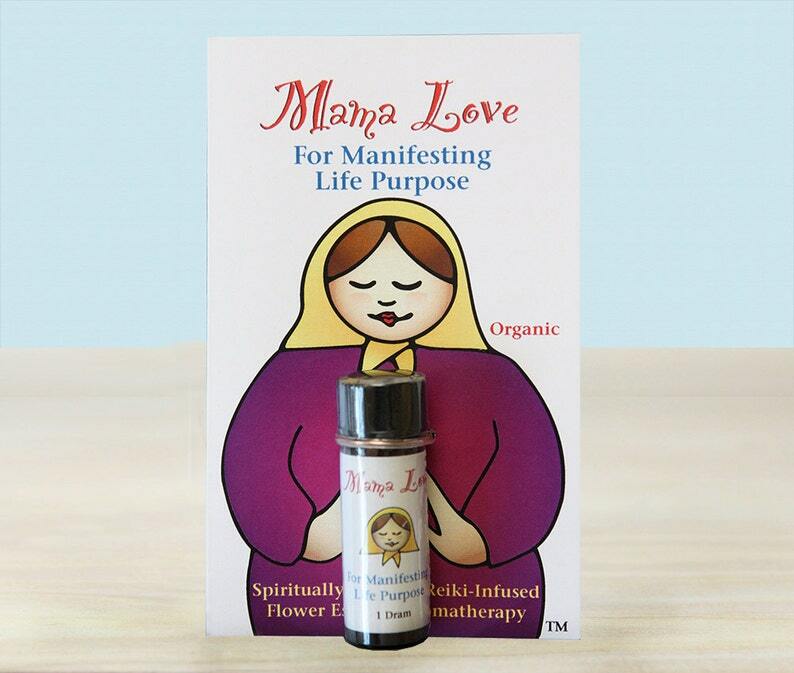 They're spiritually-guided and infused with Reiki to bring you the most beneficial products I can make! Use as easily as a perfume but know it's made to aromatherapy standards to be safe for more extensive use. For expanded awareness, clarity and upliftment, to stimulate imagination and vitalize the spirit, for determination to hold to one's ideals, and confidence in taking initiative. For recognizing and holding to one's life purpose, for the initiative to act on one's ideas, and for the disciplined focus and confident soul expression to integrate spiritual purpose with daily work. All Mama Love products are handmade by me. I shrinkwrap them with a blowdryer and tie them to cards I designed and had printed at a print shop. This flower essence aromatherapy product is intended to be used like an all-natural perfume; however, it is made to strict aromatherapy standards for its emotional effects. You won't impact an entire room. Your body is meant to soak it up and USE it. You will need to reapply it later in the day to renew its scent and helpful effects. WHOLESALE pricing for for this item is available. Send me a message -- I'm an approved Etsy Wholesaler. If flower essences alone are not enough . . . my partner Paul and I provide hour-long spiritual counseling and healing sessions—singly or as a team—to help you gain clarity into a specific life issue or direction on your spiritual path. Find out more: https://www.healingcommunication.com/. Legal Note: While this product is made to aromatherapy standards and should be safe when used as directed, it IS possible to be allergic to just about anything. If you're concerned about sensitivity check the ingredient list, do a small patch test, and only continue to use it if you like how it makes you feel.